Published from a lecture and discussion series that took place in Nov. 2010 as part of the Dong Xuan Festivals – Vietnamesen in Berlin. The lecture and discussion program “Vietnamese Diaspora and Beyond” discuss a broad spectrum of topics ranging from the transnational movements of families, cultural imaginations and theories in the Asian diaspora to national and local political issues struggling with racialization, immigration control and anti-Asian violence, from the construction of pan-asian identities and the yearning for cross-bordering forms of solidarity to the complexity and internal differences based on gender, class and political identifications within the various Vietnamese communities and their histories. It is possibly the first time that a program based in Germany tries to encounter the subject of Vietnamese/Asian immigration in Germany from a postcolonial and Asian Diasporic perspective. This effort also an invitation for the beginning of an ongoing multilateral networking of Asian German activists and scholars to co-operate with other sites of the transnational Asian Diaspora as well as with individuums and institutions who are interested in these subjectivities. As seen in the case of the Vietnamese immigration in Germany, which is especially strong in Berlin, one can see that life in the diaspora takes on a variety of forms and that this process should be considered from the perspective of the migrant subjects. By rethinking the nation from its periphery inwards, issues that have until now been neglected and marginalized spaces can now be brought into focus. This shift in perspective runs through the multifaceted analyses, discussions, photo portraits, essays, and short stories by lauded academics and talented artists, who fill this space with life and their insider perspectives. In the first part of the book, fundamental constructions of identity as well as homogenizing cultural assumptions are scrutinized and contemporary definitions of the Asian diaspora analyzed. Instead of seeing migration as a problem to be overcome, the contributions in the second part of the book shed light on its cosmopolitan potentials. Against this backdrop, multifaceted links are made to other People of Color communities in Germany. Complex composite identities in diasporic communities reflect diverse historical experiences with regard to exile, gender-specific exploitation, and racism, bearing within them cultural and sociopolitical significance. Life between hybrid cultures, political boundaries, and constructed nations are examined in this book as a kind of being-at-home. This constellation poses a central future task of postcolonial immigration societies in the era of globalization. Joshua Kwesi Aikins, Mita Banerjee, Biplap Basu, Indira Hong Giang Berghof, Uta Beth, Sun-ju Choi, Huy Dao, Hannah Eitel, Naika Foroutan, Urmila Goel, Kien Nghi Ha, Noa Ha, Feng-Mei Heberer, Tamara Hentschel, Pham Thi Hoai, Jee-Un Kim, Mai-Phuong Kollath, Alisa Anh Kotmair, Yumin Li, Nya Luong, Hanna Hoa Anh Mai, Ruth Mayer, Angelika Nguyen, Baly Nguyen, Bé Diểm Nguyễn-Xuân, Thúy Nonnemann, Günter Piening, Nivedita Prasad, Petra Isabel Schlagenhauf, Antonie Schmiz, Yasemin Shooman, Kimiko Suda, Trinh T. Minh-ha, Anja Tuckermann, Danh Vo and Alke Wierth. Translations: Madeleine Bernstorff and Emma Dowling. Proofreading: Nika Zablotsky and Peter Veit. Cover: Ngan Thi Dang. 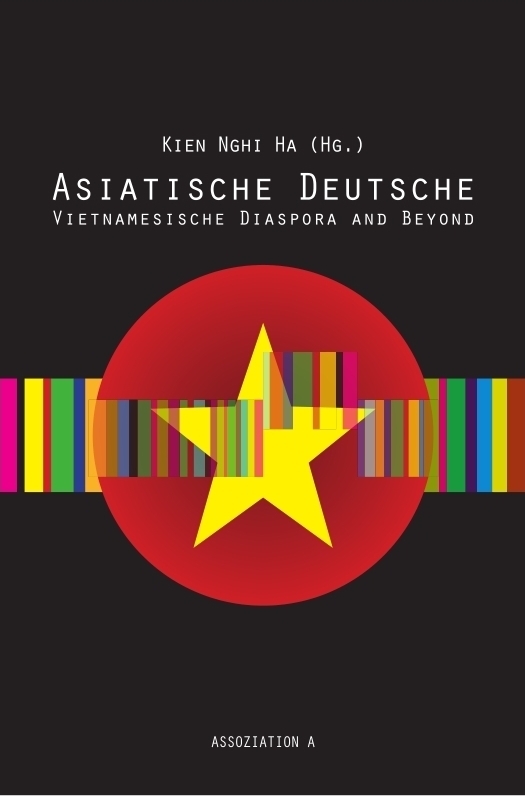 Asian Germans – the Vietnamese Diaspora and Beyond demonstrates life between hybrid cultures as it is experienced by those from within the Vietnamese diasporic community. The book analyzes the complex identities in these communities to highlight historical experiences with exile, exploitation and racism that may shape a cosmopolitan society. Approaching migration as a valuable contribution rather than as a problem, the book makes various connections to other communities of color in Germany, and recognizes the challenges of post-colonial migration societies in the era of globalization.